Can't tell you just how many Halo 3 figures this is from McFarlane. We've lost count. We can tell you, though, that for the first time in a long time, this is a new figure. Not a repaint, not an old figure with new weapons, it's all new. 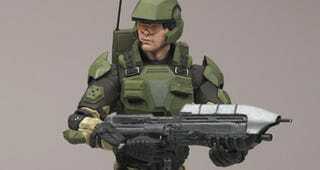 And it's a UNSC Marine, who comes with a battle rifle, a pistol and a trip mine. Should be out in March 2009, along with the other repaints/reissues in the gallery below.